Hockey is back and so are Upper Deck NHL® Game Dated Moments! 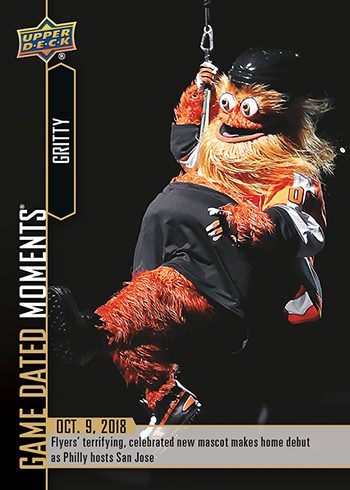 These cards, available exclusively on e-Pack, provide collectors with a unique opportunity to collect their favorite moments throughout the hockey season. Similar to last year, Game Dated Moments will be released every Friday throughout the season and will only be available in the store for one week. To unlock and purchase these packs, simply add any available hockey trading card product on e-Pack to your cart. 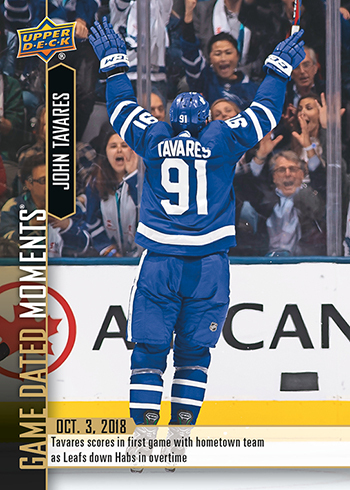 * This week’s pack of 2018-19 Game Dated Moments cards will be available for purchase in the Upper Deck e-Pack™ Store until 10/19/2018 at 8:59 am (PST). The signing of the offseason, John Tavares, comes out firing as he slaps a wrister past Carey Price to break a 1-1 tie as he helps pave the way to an exciting 3-2 OT win over the Canadiens. 4 nights later, Tavares continues to earn the hearts of the Toronto faithful while he packs in his first hat trick in blue and white as the Leafs take down the Blackhawks in a high powered scoring duel, 7-6 in OT. 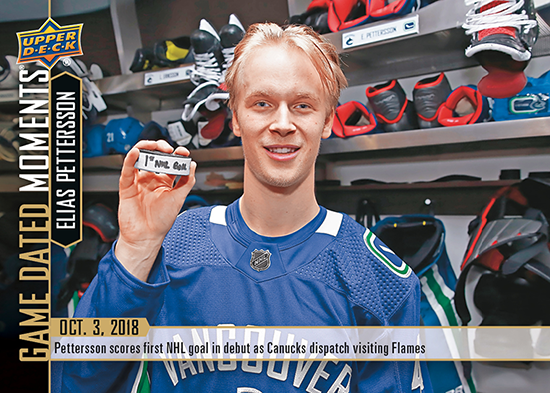 Vancouver’s next big rookie sensation, Elias Pettersson, wastes no time in finding the back of the net as he gets the scoring monkey off his back with a goal on his very first shot attempt in the league as the Canucks handle the Flames in a 5-2 home opener victory. Card #3 (Oct. 4, 2018) – The 1st Pick of the 2018 NHL® Draft, Rasmus Dahlin, Makes His Anticipated Debut. The rookie with possibly the most hype coming in to the 2018-19 season, Rasmus Dahlin, hits the ice for the first time in the regular season doling out 2 hits and gathering his bearings in almost 23 minutes of ice time. Dahlin hopes to bring his impressive pre-season performance over to the regular season in his rookie campaign with the Sabres. The 2nd pick in the 2018 NHL Draft, Andrei Svechnikov, continues to wow as his first career goal would stand as the eventual game winner in a 8-5 drubbing of the Rangers. The 18-year old Russian’s goal also stands as the first ever goal by a player born in the 2000’s. The controversial new Flyer’s mascot, Gritty, makes a full recovery after a discouraging pre-season debut which saw the big orange guy hit the ice a handful of times. To the excitement of the Philadelphia fans, and the terror of some others, Gritty looks to have a long and bright future in the league.